John Mills was born in East Malling, Kent, England. He received his BFA in Painting at University of Florida, Gainesville, and his MFA in Painting and Drawing at The California College of Arts and Crafts, San Francisco. 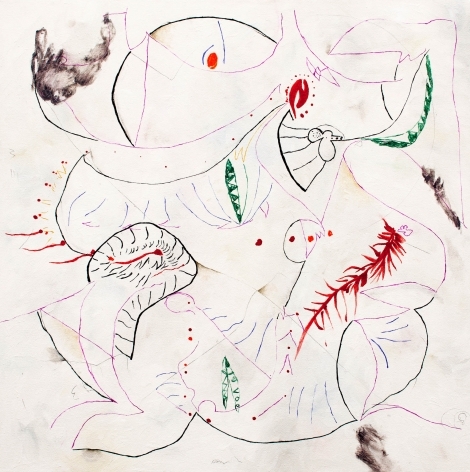 He has exhibited at Acuna-Hansen Gallery, Los Angeles; the Armory Center for the Arts, Pasadena; Feature, NY; Torrance Art Museum; Thomas Solomon Gallery, Los Angeles; Daniel Weinberg, Los Angeles; and Guggenheim Gallery, Chapman University, Orange, CA. The artist has received the Barclay Simpson Award and the Rema Hort Mann Foundation—YoYoYo Grant for group project proposal. His artwork is in the Collection of J.P. Morgan Chase Contemporary Art Collection. 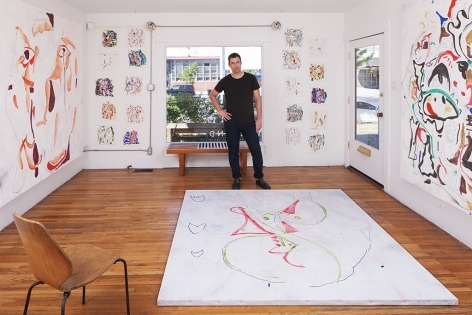 He has been exhibiting with the Rosamund Felsen Gallery since 2014. Mills lives in Los Angeles. Jason Ramos reviews the recent exhibition John Mills: For Your Eyes Only at Rosamund Felsen Gallery, Los Angeles. "For Your Eyes Only, John Mills’s newest solo exhibition at Rosamund Felsen Gallery, is not about the 12th James Bond film from 1981 starring Roger Moore as 007. But the title is a clue as to what parts of the viewers’ body should be prioritized when experiencing this current body of work. 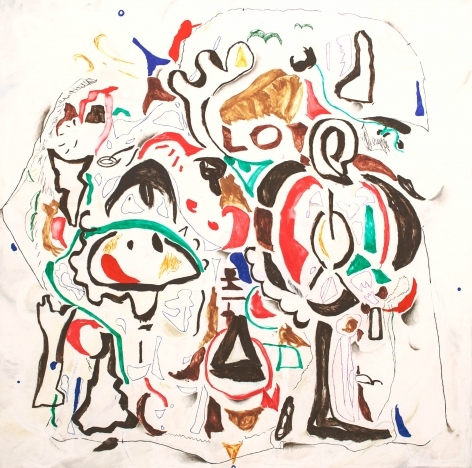 Mills’s second solo with the gallery has him continuing with the square format, the white-ish grounds, the modest-to-heroic scale, and a visual language inspired by early European abstraction. 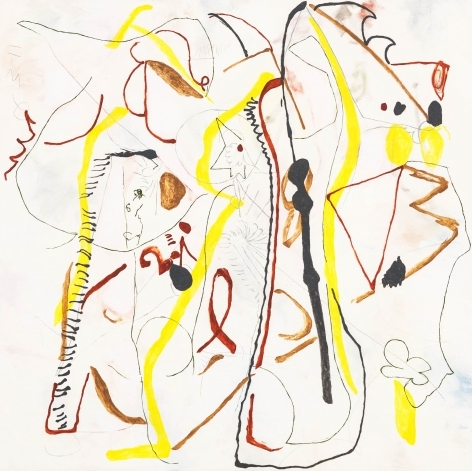 A surface critique might argue for some more bolder, declarative evolutionary changes from one exhibition to the next, but as pointed out in the title, these works aren’t for a viewer’s cynical, novelty-seeking lizard brain. These works are for your eyes, only, the eyes being the only part of our brain that is in actual physical contact with the world outside of our own heads. Having staked his claim with his format, ground, scale and referents, Mills’s new work is free to juggle the possibilities and delights offered with painting’s phenomenological effects. Space is stacked, folded, stretched and warped; marks, dabs, and scribbles flow, writhe and repeat themselves as if moving through time. Elements in each composition obey a felt sense of optical logic, the edge of the canvases being the most influential formal element. In the larger works Ellipsis, Sign Language, and Formal Foilbles, dabs/blobs/circles/dots bounce off the frame like Pong, tracing their paths into another spatial dimension, never bouncing out of the frame. Underneath and around them in the background and on their level, more familiar Mills-esque elements follow the blobs’ lead. 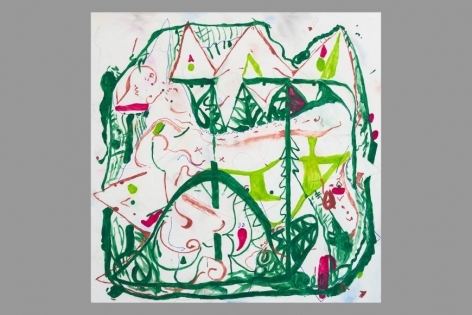 More than even his last exhibition, Mills’s work reads like transcriptions of consciousness, reactions to emerging visual structures in each painting, a result of their being based on smaller drawings. Flashes of identifiable imagery are now joined in equal measure with more direct visual sensations; in Birdcage, Off the Wall, and Mental Charms the picture plane is carved and contoured on top of distant, hazy, clouds of fluffy background. While the emergent imagery in his last solo, High on Signs, frequently took the shape of suggested faces, heads, leaves and feathers, here scribbled into the grounds are goofy cartoon character bits and pieces, comically floating around, as in the paintings Commune and the aforementioned Off the Wall, recalling somewhat the line and character of Far Side cartoonist Gary Larson. Suggestive associations abound in all the paintings, perhaps the most visually poetic being Out There, a smaller work from 2015. Simple diamond shapes read like kites in the wind, completing a recurring motif of motion through time and space. This work along with the paintings titled Master Stack and Nature Crush inch up to referencing landscape imagery, yet another possibility offered by the broad range of the abstract square format, the ultimate modernist invention. Mills’s squares this time, however, rely less on their identification as revivals of modernist aesthetic than as accessible, sensitive meditations on the affecting presence of marks, dabs, lines, scribbles, doodles, smudges, shapes and other basic visual responses. 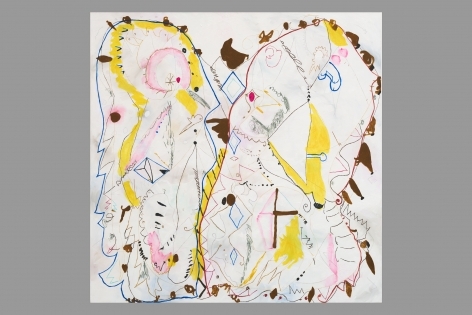 They are in a closer arena of work that would include such masters of affecting simplicity as Richard Tuttle, Mary Heilman, and Robert Ryman, though with an eye towards the basic components of intuitive pictorial imagery that is reminiscent of the recent work of Laura Owens, David Lloyd, Chris Martin, and Torey Thornton." 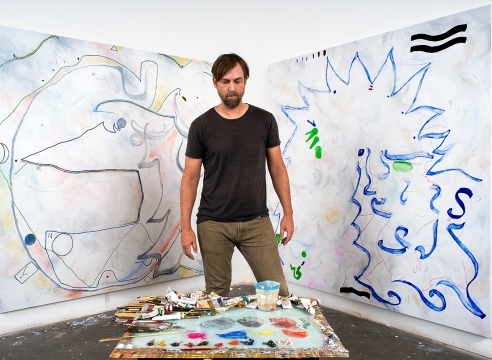 If doodles could hallucinate, they’d probably see images similar to those that flit into focus across the sensuous surfaces of John Mills’ new paintings. 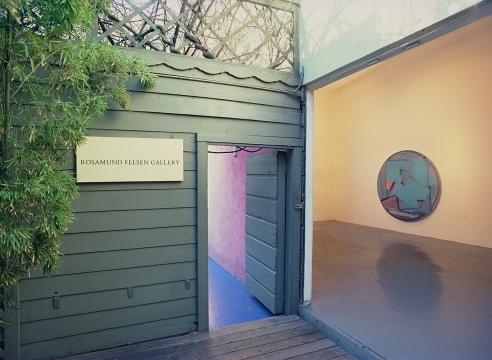 At Rosamund Felsen Gallery, “For Your Eyes Only” consists of 15 small, medium and large canvases that the L.A. artist has dabbed with brushes and scratched with both ends of pencils, sometimes leaving graphite marks and at others incising lines into layers of paint that have not yet dried. Each of Mills’ daydreamy paintings transforms the casual scribbles and meandering marks of doodles into a pleasurable romp that wends every which way and often ends with an explosive realization of the freedom to be had — and the wonders to be discovered — when you don’t where you’re going. Aimlessness rarely looked better. Nor delivered more consequential results. In the meditative balance of figuration and abstraction, John Mills engages mark making with new visual playing fields, an agile order of painted space and the ground it roots itself in. Colorful forms and gestural linework bleed into one another creating compositions of meandering romantic terminuses defying gravity over muted white ground, void but determined. John Mill's abstractions are light on density; there's typically more white or off-white backgrounf space than foreground imagery. But what initially may come off as faint and/or ineffectual quickly becomes experientially complex. Bare-bones efficiency and wondrous luxury mate in John Mills’ new paintings, which are some of the most casual mischief to have come out of Los Angeles in some time. 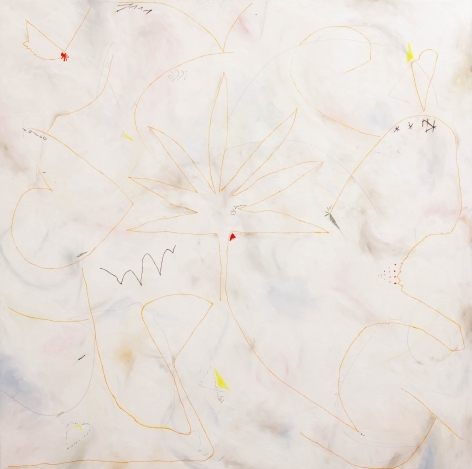 At Rosamund Felsen Gallery in Santa Monica, “High on Signs” fills three rooms and a hallway with 20 paintings that are easy to approach and hard to tear yourself away from. AS: When I look at your paintings I imagine some of the marks are made from felt tip pens, is that something you use in your drawings? JM: Most of my paintings are based on prior ink drawings. For a long time I used black ink on paper, then I discovered coloured markers and that opened up the process because then I could start drawing with colour as a means to create composition and think about how shapes and colours interact on the initial drawing surface. It was a revelation, but I have been doing this now for a long time. So the painted marks reference prior marks that I made in a drawing process. Sometimes they’re mediated to appear almost precisely how they were originally in the drawing and sometimes I allow the paint to be thicker or barely there at all. I diverge from that script often by using the tactility of the paint, how paint behaves differently to ink.